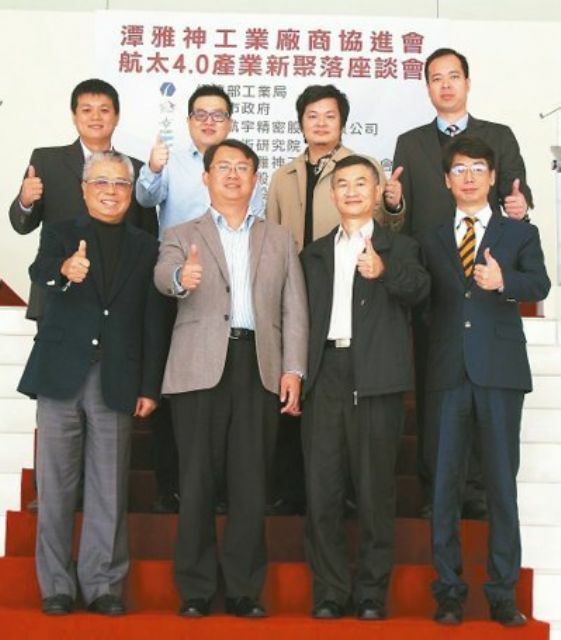 Taiwan's Industrial Development Bureau (IDB) of the Ministry of Economic Affairs (MOEA), the Taichung City Government, and San-Kang Industrial Association (SKIA) recently announced that they will set up the "Aerospace 4.0 Industrial Cluster", an industrial hub to specifically develop aerospace business opportunities in the Taichung City Precision Machinery Innovation Technology Park in central Taiwan. J.H. Huang, secretary general of the Industry 4.0 Promotion Office under the MOEA, pointed out that MOEA's industry innovation platform will provide a budget of NT$150 million (US$4.69 million) to help aerospace equipment makers "intelligentize" production lines to set up supply chains using Big Data, online controls, robotics, etc. Huang stressed that his office will help SKIA and the M-Team machinery makers' alliance set up an advanced testing and measurement center, which can help local companies gain AS 9100 certification, essential in aerospace manufacturing. Two leading aerospace companies in Taiwan, the Aerospace Industrial Development Corp. (AIDC, reportedly the largest aircraft maker on the island) and Evergreen Aviation Precision Corp. (EGAP, an affiliate of Taiwan's Evergreen Group that manufactures aerospace parts), signed a cooperation agreement with the M-Team and the Industrial Technology Research Institute (ITRI) to set up the A-I-M Alliance. The A-I-M alliance includes A-team (aerospace companies), I-team (Intelligent R&D institutions) and M-team (Machinery manufacturers), being made up of Taiwan's machinery companies and aerospace manufacturers who recently announced the mission to further cooperate on research, development and manufacturing along the aerospace industry chain. Y.D. Huang, chairman of SKIA, emphasized the strategic location of central Taiwan, which is the production hub of precision machinery, adding that his association aims to set up Industry 4.0-compatible supply chains by working with related industries such as bicycle, hand tool, auto and motorcycle parts, etc. SKIA has more than 230 member companies, including virtually all major precision machinery developers and manufacturers in central Taiwan, whose annual production value already outstrips NT$100 billion. (US$3.1 billion). A senior official of the Machine Tools Technology Center under ITRI cited a statement by Boeing, a top-2 aircraft maker, that only sub-1.2m aerospace parts will be produced or processed in Taiwan. He urged EGAP's parent the Evergreen Group to strive to win more Boeing orders for Taiwan's makers, by leveraging its bargaining power during procurement of Boeing planes.